If I write it down, I do it. At least eventually! I need my lists. I’ve tried so many ToDo list programs and apps, but I always end up going back to paper and pen. The apps either have too many features, or not enough. I’ve now found one that is just right. To cross an item off my list and have it go away. But, I like it if it is still there somewhere so I can see what I’ve accomplished. To re-order the list as priorities change, and I want to do that by dragging it – not by changing a date due. No dates! Just list items. 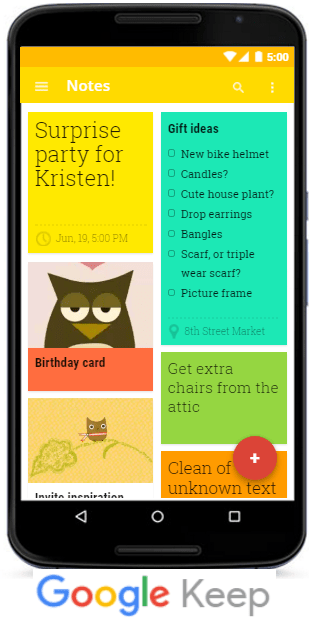 Google Keep is the note-taking app from Google. It is a competitor to Evernote and OneNote and Apple Notes. I’ve written about it before, back in 2014. But Google, as usual, keeps tweaking it. I’m not sure when the latest tweak to its list feature happened, but I really like it. To make a list type of note, just tap the bullet list icon at the bottom of the screen. Then, each item you type will start with an empty checkbox. When you complete the item, just tap that box and it gets checked. It also gets moved to the bottom, in a section for checked items! When you want to change the priority of your items, just drag on the 6-dot button to the far left of the item and move it up or down. That’s it! Everything I want and nothing more. For shopping lists, you can even UNcheck items at the bottom when you run out and need to put that item back on the list. It will immediately move up. Will Google Keep replace paper and pen? We’ll see. There’s still something about putting pen to paper that makes me take it more seriously, but when that paper isn’t handy I don’t get it on my list. Google Keep is always there, on my phone, tablet and computer. It’s completely cloud-based so when I enter an item on my phone, it’s there when I look at my computer. When I check something off, it’s at the bottom of the list no matter what device I’m using. 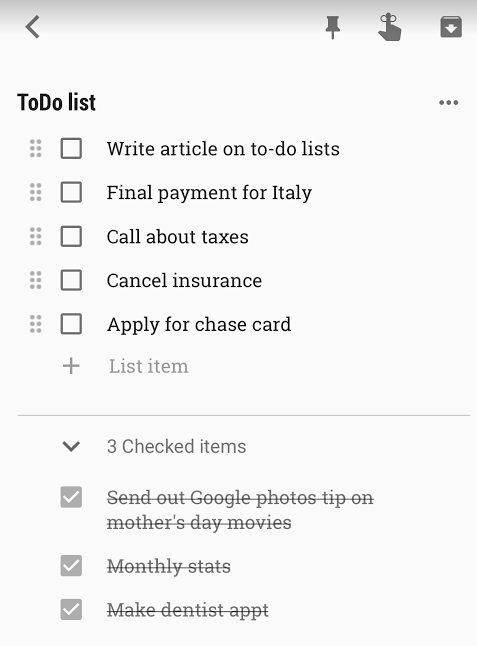 If Google Keep can’t break me of pen and paper ToDo lists, nothing can. Available for Android and iOS, or on the web and chrome store.